\(M\leq p \leq M + L\) with \(M\to \infty,~ L/M \to \beta > 0\). 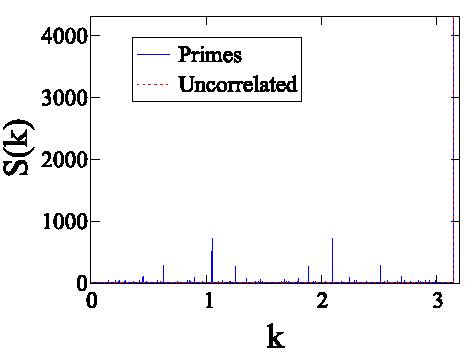 By analyzing the structure factor, we prove, conditionally on the Hardy–Littlewood conjecture on prime pairs, that the primes are characterized by unanticipated multiscale order. Specifically, their limiting structure factor is that of a union of an infinite number of periodic systems and is characterized by a dense set of Dirac delta functions (Bragg peaks), similar to but different from the dense Bragg peaks that arise in quasicrystals and standard limit-periodic systems. Primes in dyadic intervals are the first examples of what we call effectively limit-periodic point configurations. This behavior implies anomalously suppressed density fluctuations compared to uncorrelated (Poisson) systems at large length scales, which is now known as hyperuniformity. Using a scalar order metric \(\tau\) calculated from the structure factor, we identify a transition between the order exhibited when \(L\) is comparable to \(M\) and the uncorrelated behavior when \(L\) is only logarithmic in \(M\). Our analysis of the structure factor leads to an algorithm to reconstruct primes in a dyadic interval with high accuracy. The discovery of the hyperuniformity and effective limit-periodic behavior of the primes provide new organizing principles to understand the fundamental nature of patterns in the primes.